If you hadn't picked up on my main theme of cooking, I'll lay it out for you . . . E-A-S-Y! This lasagna is no exception. It has finally started to cool down here in Texas (a freezing 77 degrees today), so I'm getting in the winter mood with some favorite cold weather meals. As I mentioned in an earlier post, I love pork products. Everything is better with sausage. Enjoy. Italian Sausage Lasagna 1 pound sweet Italian sausage (ground) 1 can of your favorite spaghetti sauce (I used Puttanesca, because I love anchovies) Lasagna noodles 1 bunch flat leaf Italian parsley Fresh basil 16 oz. Ricotta cheese 1 egg 4 oz. shredded Mozzarella cheese 2 oz. shredded Parmesan cheese 1 teaspoon sugar Salt, pepper, any other spices you like. Preparation 1. Brown the sausage over medium heat. (about 10 minutes) 2. Add spaghetti sauce and stir. (about 5 minutes) 3. Add salt, pepper, sugar, chopped basil, chopped parsley, and any other Italian seasoning you want to throw in there. Stir together and let simmer as long as possible, 4 hours or 10 minutes. 4. Mix Ricotta cheese in a bowl with one egg. Assemble the Goods 1. Preheat oven to 375 degrees. 2. In 13x9 baking pan, spread 1/2 of sausage/tomato sauce. 3. 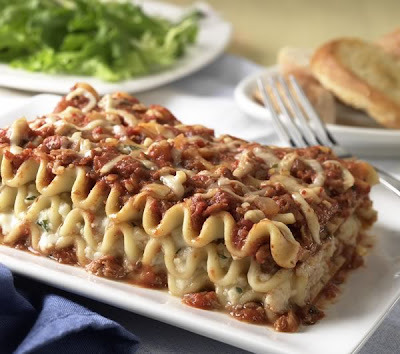 Place uncooked lasagna noodles over the sauce. 4. Spread 1/2 ricotta cheese over flat noodles. 5. Sprinkle 1/2 shredded mozzarella cheese. 6. Repeat steps 3-5, and top with Parmesan cheese. 7. Cover with foil, and bake at 375 for 25 minutes 8. Uncover and bake for additional 25 minutes. 9. Let cool, top with fresh basil leaves, and enjoy.